Are you tired of me bitching about moving being hard work? Uh yeah, me too. But we really have made a lot of progress in the past few days with unpacking, organizing, ordering new furniture(! ), and even piecing together a semi-normal routine. And while we’ve definitely had our fair share of pizza, tacos, and Whole Foods hot bar/cookie case (having this walking distance is a real game changer, folks), we’ve also managed a few home-cooked meals in the new kitchen. 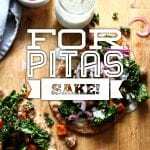 These sheet pan pitas were a BIG hit. 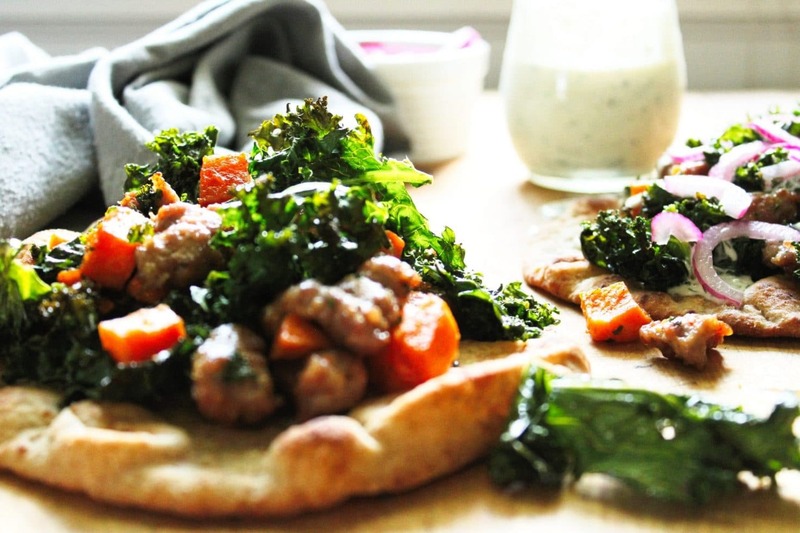 They’re healthy (see kale and sweet potato), delicious (enter sausage), ready in about 30 minutes, and only use one, single sheet pan. Did I mention that we no longer have a dishwasher? Yes, the one-pot/pan meal will be making more regular appearances round here methinks. So thanks for all of your mental and emotional support during this time of transition. It’s been a bit of a ride, but I’m so happy to be able to share it and THIS ↓ with you. 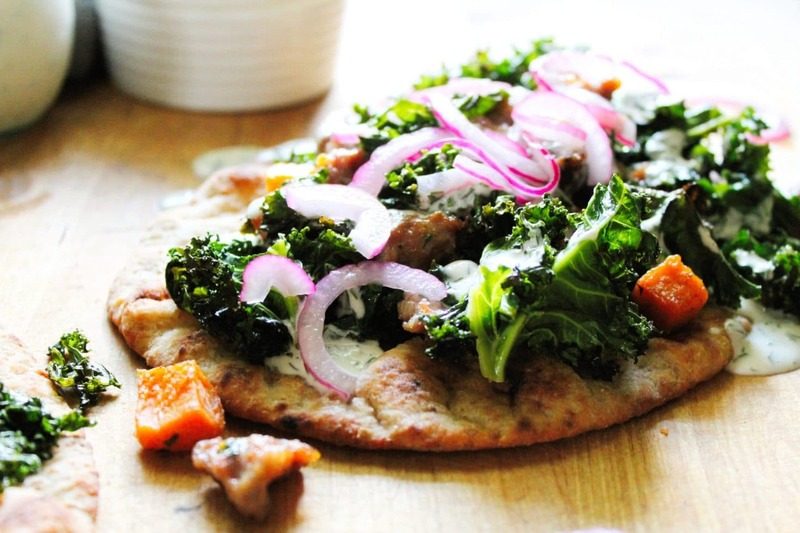 I actually used naan breads for these, but anything in the flatbread territory is a-ok. Also, a word to the wise, if you want to eat these with your hands then maybe don’t pile them with too many goodies…however I like all the goodies so I eat mine with a fork and knife. Drizzle a rimmed baking sheet with 1 tablespoon of olive oil. Add sweet potatoes and toss to coat. Crumble bite sized pieces of sausage onto the baking sheet. Add salt, cumin, paprika, and cayenne if using. Toss everything to combine and spread into one even layer. Roast on the middle rack for 15 minutes. Add kale to the baking sheet and stir to evenly distribute. Transfer back to the oven for an additional 8-10 minutes, or until the kale has begun to wilt and get crispy at the edges. Keep an eye on it because burned kale tastes…burned. Brush the pitas with the remaining olive oil and sprinkle with salt. Place pitas in the oven (I usually do this right on the oven rack, because I don’t want to do any more dishes), and bake for 5 minutes until they’re warmed through and just beginning to crisp up at the edges. 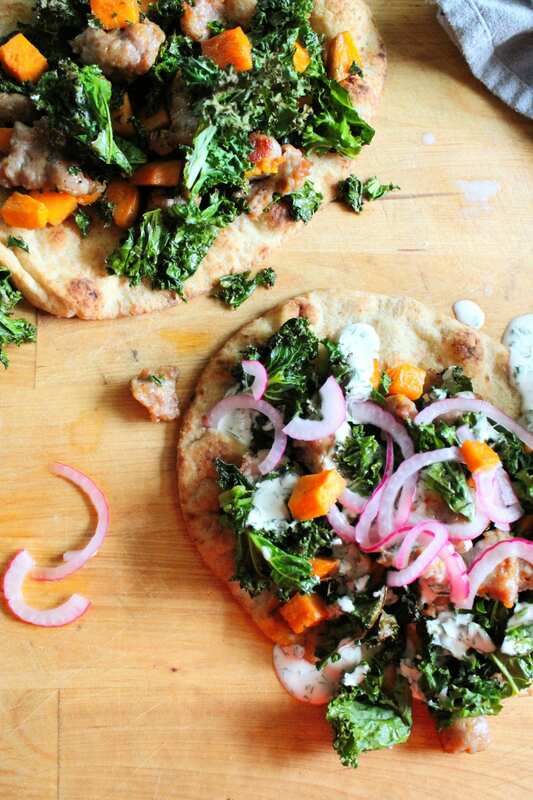 To assemble your pitas, slather with garlic tahini dressing and then pile high the sweet potato, sausage, and kale mixture. Top with more garlic tahini dressing and garnish with pickled red onions. 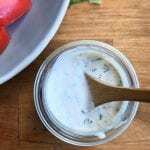 This recipe is slightly adapted from the one on my chicken shawarma salad. I love it so much on all the things though, so it’s in my fridge pretty much all the time. Great on eggs, leftover chicken, salads, or sandwiches. Also, feel free to use whatever herbs you have lying around – I often sub in parsley for the dill or mint.